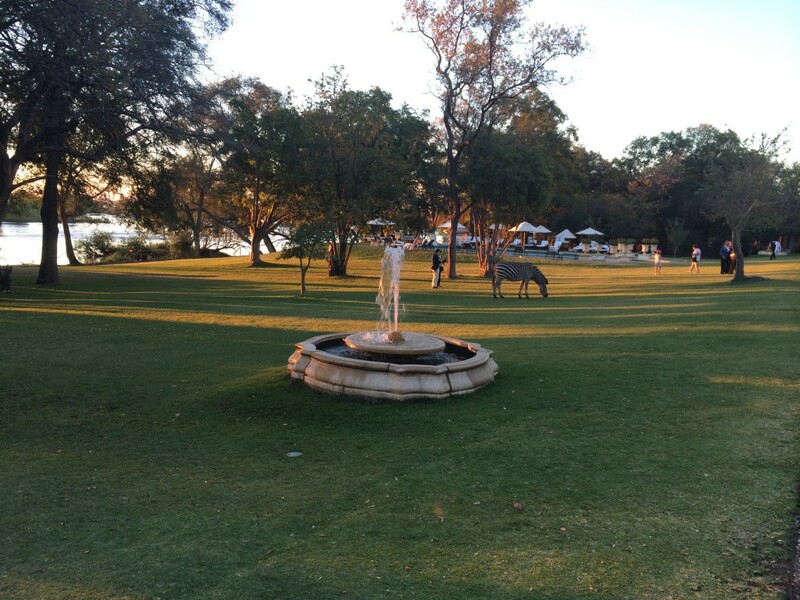 The city of Livingstone is a lively eclectic mix of tourist destinations and local living. It is the hub in Zambia for tourism, especially adventure tourism. Most people come for the epic views of Victoria Falls, but Livingstone offers much more. I really enjoyed biking around the city, stopping at the small markets and shops and talking to the local merchants, restaurant owners and people just a hangin out. First is first. Livingstone is home to one of the most spectacular sites in the world. The Victoria Falls. It's a UNESCO world heritage site and is legendary. A UK explorer named...what is it? ...'Dr. Livingstone I presume'? Yes, Dr. David Livingstone 'discovered' the falls in 1855. He did the white people discovery part. 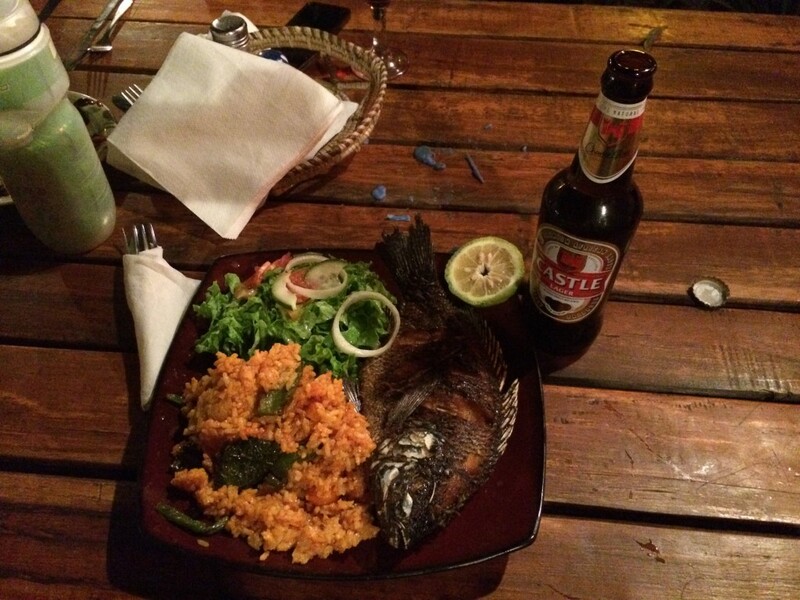 The city of Livingstone is a historic, British colonial city. I can't describe the euphoria of seeing the falls for the first time. It starts with the walk towards the falls. Seeing the mist and hearing the thunder of the water. This place had been calling me for a long time. I've always wanted to see them and visit Livingstone. Hearing that aggressive booming and feeling those first drops of water while walking down the path towards the falls made my legs weak and my heart swell. All of a sudden there's a clearing and right there in front of you is the most amazing site you've ever seen. It will get you high. Eat your heart out Betty Ford alumni. You wake up early on your first morning in a strange new place, so far away from anything or anyone you know. You hike down slow country roads, down paths and through a clearing and there before you, is this.. I never really had the desire to Bungee Jump. I of course had to do it to keep my rep solid, but uh, I wasn't foaming at the mouth to do it. 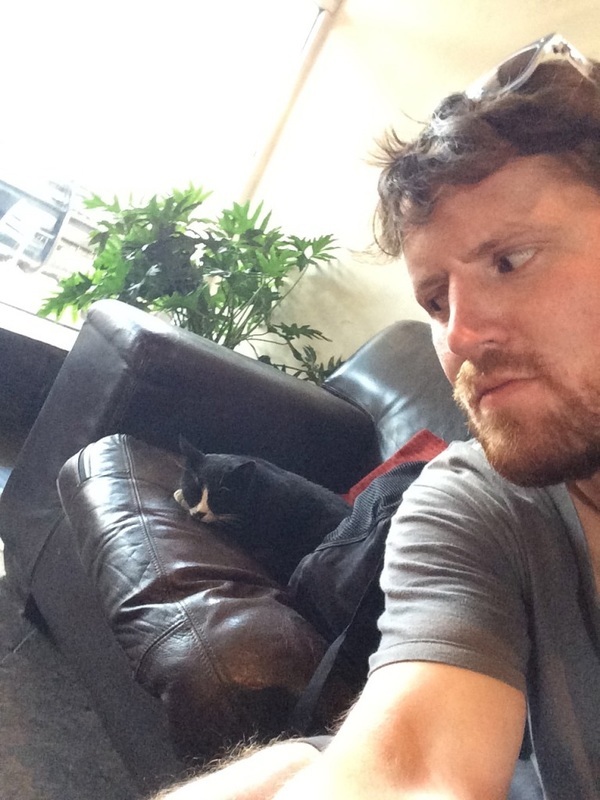 I wasn't afraid to, it was just the volume had been turned down from my experience skydiving and climbing etc. I didn't think it would be that amazing. BUT! I have to say...it was really great and the feeling of bungi'ing is totally different than any other extreme activity. 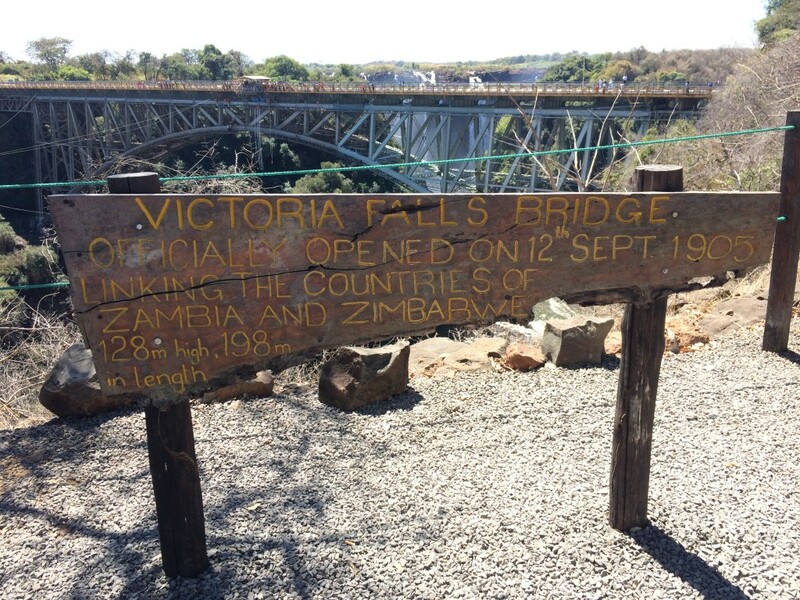 It all takes place on the bridge spanning Zambia and Zimbabwe. The views from the bridge are spectacular. The views on the way down will be tattoo'd in your mind forever, allowing you to relive the moment over and over. Its the experience that keeps on giving. I did a bungee jump, a bungee swing and the hipline (what? I had to hipline..it came with the package). I really love safety features in all the activities I do. I enjoy learning about them and seeing them in practice. 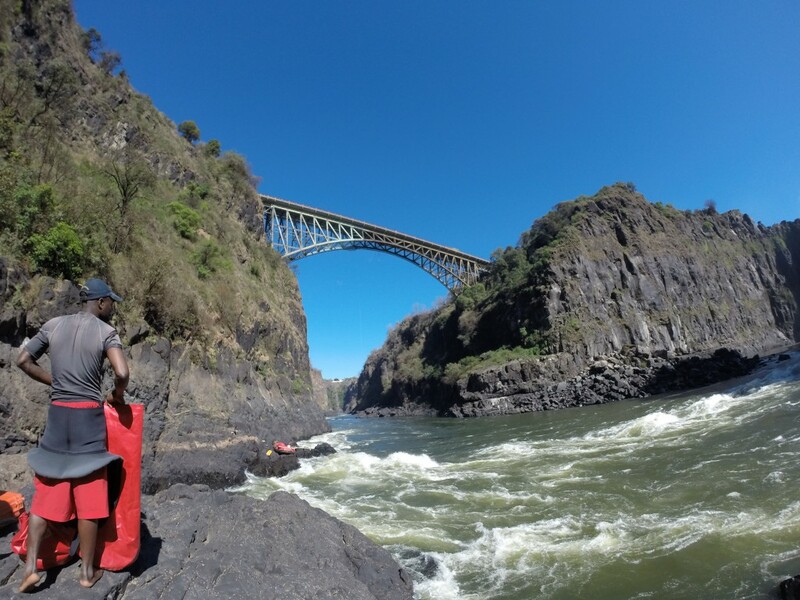 'The Big Air Company' at Victoria Falls is an experienced bungee operator. They conform to the rigorous standards and guidelines that govern this activity. They use a body harness backup, so it's not just your ankle attachment. I believe they also use a braided exposed shock chord that makes for a longer, softer bounce. As with any extreme activity, injuries and even death can occur. To my knowledge, there has not been a fatality at this location. (There is a legendary video of an Australian girl jumping and the cord snapping. She plunged into the water, but survived. (it's on youtube)). This video changed nothing for me. I still think it's a safe activity. Cost. I did the whole package - Bungee - Swing Bungee - Zipline. You don't have to book this in advance, but you can. This activity takes about 30 minutes. The package takes a little over an hour. WHOA! This was probably the coolest thing I did in Africa. The gorge is beautiful, the water relentless and my tour guide was a legend. Since my rafting trip, I've talked to a few river rats (rafting pros) and they say that this alley of rapids is one of the best in the world. 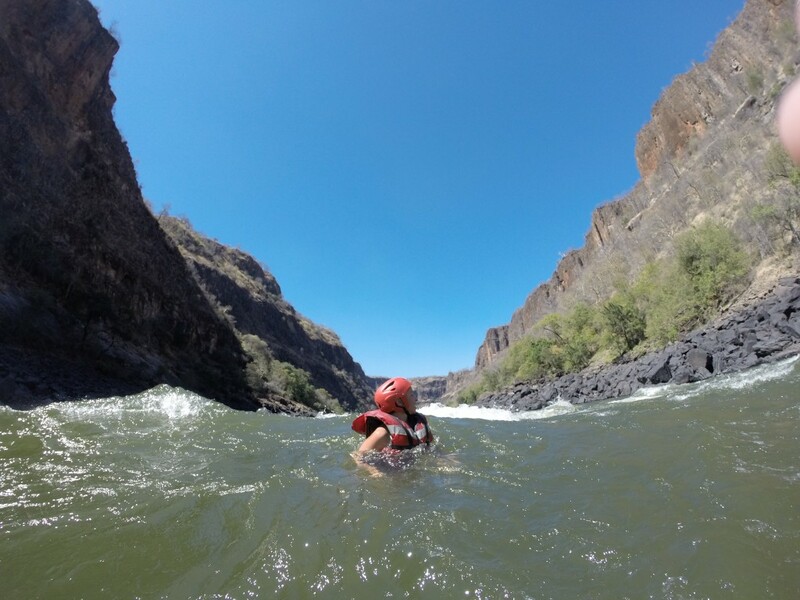 It boasts several class 5's and when you're not swallowing tons of croc infested water, you can be amazed by the sites in this beautifully carved out gorge. 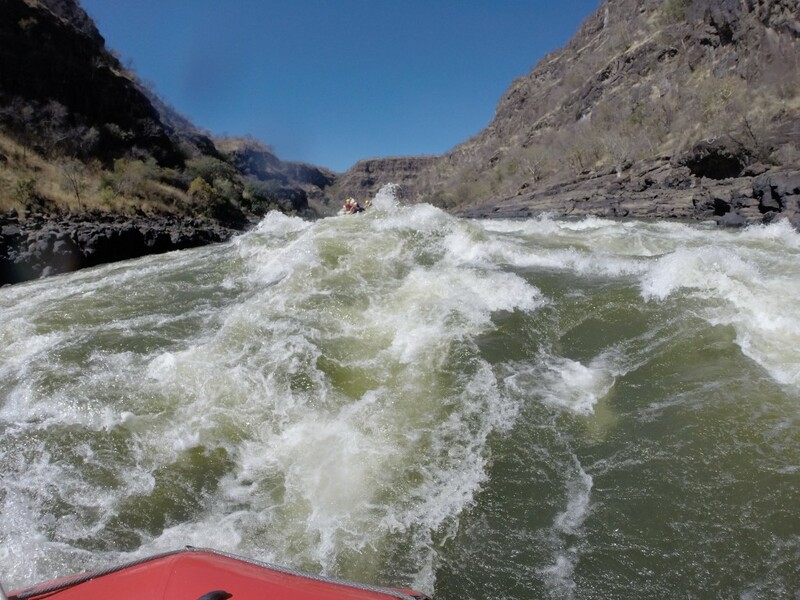 Technically there are 25 rapids in this run. You start in the 'Boiling Pot', which is right underneath the bridge you'll probably jump off at the feet of the Victoria Falls. 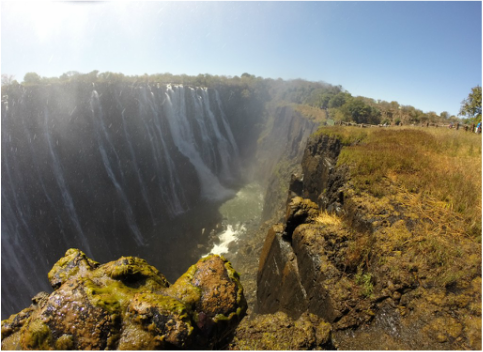 There's a great view from the bottom of the falls as you start your journey down the Zambezi. The best tip I can give is to use Bundu Adventures and ask for Potato. He's the man. This is a physical activity, both in the boat and ..well not in the boat. You don't have to be in peak physical condition, but you should be able to hold your own and paddle for several hours. Do the full day trip. They offer half day trips, but it's really worth just doing the whole day. You'll live to regret only being half awesome. There are seasons and months of the year where parts of the river are un-raftable due to high water. You should check in with one of the operators to see what the season is looking like. What to bring.. courage, comradery and a sense of humour...and sunscreen. I went barefoot and just wore ma trunks. There is a hike down to the starting point, so wear hiking shoes. If you're a wuss, they also have wetsuits! If you're cold, you're not working hard enough! So there is an attraction called Devil's Pool. This is an area in the falls that you can swim in that is right on the edge of the falls before they curl over and plunge hundreds of feet. This pool was closed when I visited due to high water levels. This was unacceptable to me, so I founded my own pool I have coined 'Satan's Pool'. Don't let them tell you you can't! There is nice footage in the above video of the new attraction. I rented it at my hostel, Fawlty Towers and I'm sure wherever you decide to stay, they'll help you out. Lock your bike up and leave it in busy places. I asked the rental guy how often rented bikes get stolen. His response was a laugh and a shrug. I guessed pretty damn often. The Livingstone Museum is actually pretty darn good and worth the few dollars and hour it takes to run through it. It's your typical history of the area. Do it on your trek into town to visit the markets. I stayed at a hostel named after one of my favourite British comedies, Fawlty Towers. 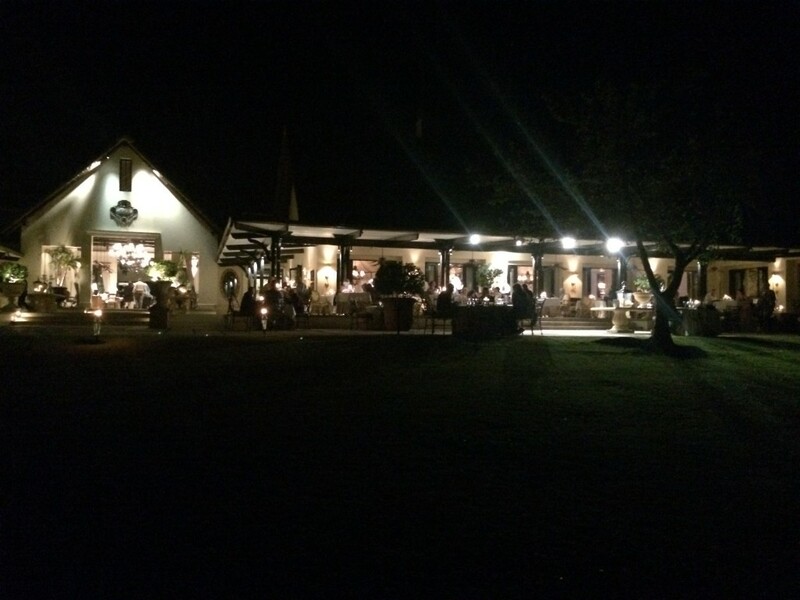 I was drawn by the name, but stayed based on the amazing reviews and location. This is probably the nicest hostel I've ever stayed in. I feel like I'm lying by calling it a hostel. It's more of a motel, but without the sleazy euphemism? Er..assumptions made by using the word motel. There is lush green space, a swanky pool and bar area and free pancakes at 3pm! Who's at their hostel at 3pm though? ;0 Well me my first day there, so I can review the pancakes. They were excellent! There are 24 rooms in this joint, ranging from deluxe private rooms to dorm style rooms. I decided to spoil myself after my camping stint in Botswana and got a private room. Its easier to edit video in the wee hours when you're alone. I did get a tour of the facility and the dorm rooms and pretty darn nice. The location is central and I believe the closest hostel to the falls. Though you'll still need to cab to the falls, unless you're dumb like me and enjoy long walks on country roads with baboons and elephants. Decent kitchen here and a grocery store across the street. I had my own little tupperware party and packed lunches like an adult. The rooms range from $15/night for a dorm room to $75/night for a twin deluxe ensuite. Word on the street is that you can camp there too, but I saw nary a camper. You probably want to book this sucker is advance because it is well known and could sell out fast. 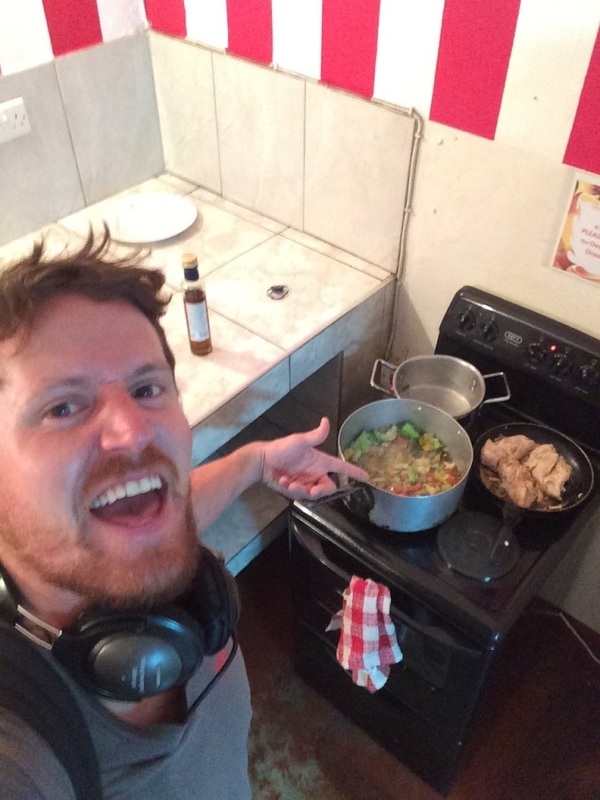 I did visit two other hostels while I was in Livingstone and 2 hotels (super pimp'd out crazy insane hotels). Fellow Canadians Sean, Shauna and me the day they left Africa. We ran into each other in Cape Town, Swakopmund, Chobe and then of course in Livingstone.